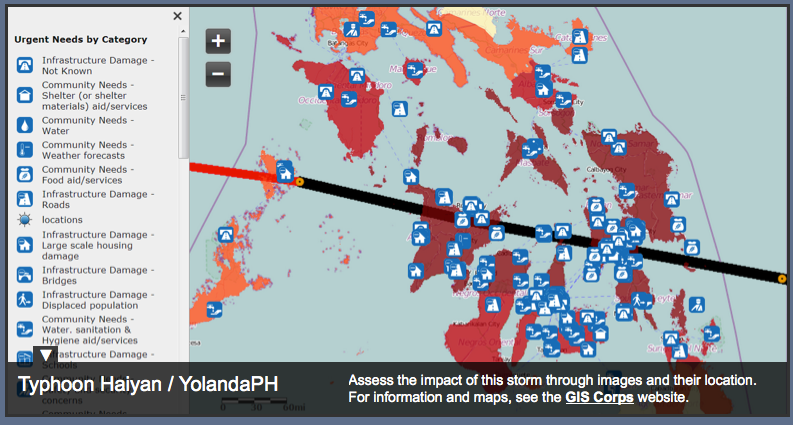 YolandaPH is a ESRI-based mapping platform for post-disaster response in the Philippines. Snapshot above. These maps were produced using a selection of photos from Twitter, Facebook, news articles, and other websites curated using the MicroMapper platform. The locations are approximate and more photos and information are currently being mapped and categorized by the GIS Corps. Hundreds of digital humanitarian volunteers worldwide, including media monitors, translators, GIS specialists, statistical analysts, emotional support teams, and standby task forces, are working around the clock with rescue and recovery efforts, particularly in the hard-hit eastern city of Tacloban. "DHN is sorting through very high volumes of social media information,” said Sara Jane Terp, a DHN volunteer with the Standby Volunteer Task Force. Approximately 182,000 tweets have been collected and automatically filtered down to 35,715 based on relevance and uniqueness, according to Carden. Volunteers use triangulation (comparing information against two other sources, such as traditional media and official government reports) to verify information. The time-consuming work is made easier because of the large number of volunteers working in different time zones. Useful slideshow of the workflow is found here. UPDATE: Nice round-up of disaster response from flying sheep here.